Brand: Re-Ment Product name: 0:06 ごはんま～だ?! (Is dinner ready yet?) 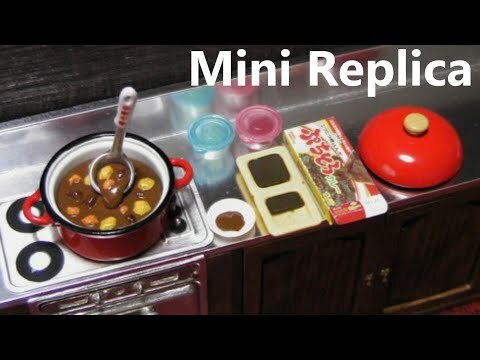 2:54 お母さんの台所 (Mom's kitchen) Made in 2005. This set is discontinued. (1) It cost 263 yen per set. (2) For ages 12 and up. Those are not toys for a young child. You keep them displayed as a collection. (3) How to store them. http://youtu.be/Mxpwz5eAZ_8 (4) They are not magnets. They snap in place or are just set in place. (5) It does not really cook. (The items didn't actually change colour. They're just before-and-after things.) 0:47 Curry roux. 2:07 Rice cake wrapped with nori seaweed. The tiny white square things are supposed to be rice cakes (mochi). 4:47 I lost quail eggs.